The Ekspress AM-4R Satellite is the replacement for the lost Ekspress AM-4 spacecraft launched by a Proton/Briz-M on August 17, 2011. A problem with the inertial guidance platform of the Briz-M caused the flight to be aborted after four of five upper stage burns, delivering the satellite to a lower-than-planned orbit with no chance of maneuvering into Geostationary Orbit using its own propulsion system. In a post flight investigation it was determined that the Flight Program of the Briz-M did not allow sufficient time for a delta rotation ahead of its third burn, leading to the intermediate gimbal ring for the pitch axis in the upper stage’s gyroscope unit reaching a hard-stop position. Subsequently, the upper stage lost its inertial reference frame and the pitch axis measurement started drifting as the flight continued. No longer flying in the correct attitude, Briz-M incorrectly executed its third and fourth burns, leaving the functional satellite in a useless orbit. Proposals to use the satellite to provide communications coverage to Antarctica for 16 hours per day from an elliptical orbit emerged, but the decision to deorbit the satellite was made in March 2012. Performing a deorbit burn at apogee on March 25, 2012, Ekspress AM-4 conducted a targeted re-entry over the Pacific Ocean to allow surviving components to splash down away from populated areas. The Russian Satellite Communications Company, operator of the Ekspress satellite fleet, ordered an identical replacement in 2012 to launch in 2013, however, the launch was pushed into early to mid-2014. 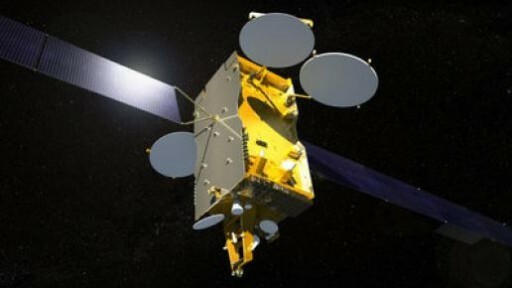 Built by Airbus Defence & Space (EADS Astrium), Ekspress AM-4R uses the flight-proven Eurostar-3000 spacecraft platform that is capable of hosting powerful communications payloads with a payload power exceeding 10,000 Watts. The satellite has a launch mass of 5,775 Kilograms with an empty weight of just under 1,500 Kilograms. Overall, the spacecraft is 7.5 meters high and has a span of 31 meters when fully deployed in orbit. Two deployable solar arrays are used for power generation featuring triple-junction Gallium-Arsenide solar cells. Power is stored in onboard batteries while a Power Conditioning and Distribution Unit regulates the satellite’s power bus and controls the state of charge of the batteries. A dedicated bi-propellant propulsion system will be used for apogee maneuvers and stationkeeping maneuvers in Geostationary Orbit. Eurostar-3000 is three-axis stabilized featuring a state of the art navigation system. The satellite provides precise Earth-pointing capabilities. Ekspress-AM4R hosts a powerful communications payload at a power of around 14kW operating in the L-, C-, Ku- and Ka-Band frequencies and consisting of 63 Transponders. 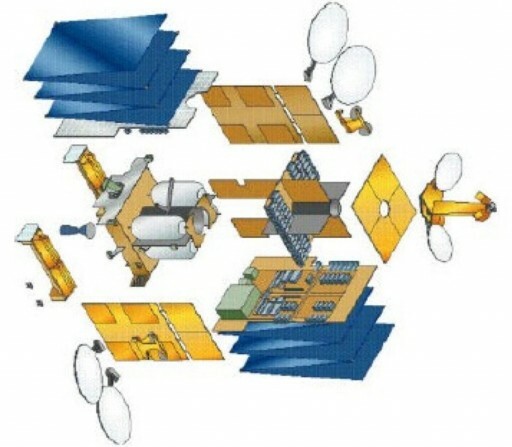 The satellite is equipped with 30 C-Band transponders providing a fixed beam for coverage of a large portion of Russia and surrounding regions and a steerable beam that will be used to cover regions within the field of view of the satellite. 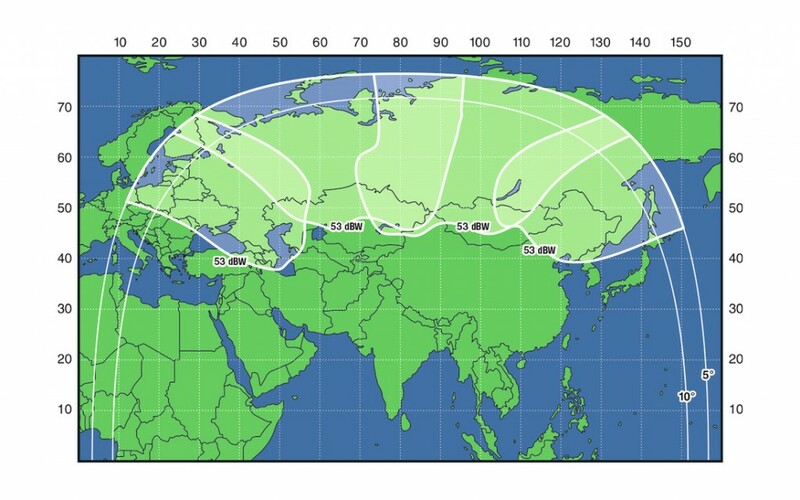 28 Ku-Band transponders provide coverage of Russia and CIS countries into eastern and central Europe using multiple fixed beams. A steerable beam can be used to provide additional coverage. Two-Ka Band transponders are used for two steerable communication beams. Three L-Band transponders are also installed on the satellite. Services provided by Ekspress AM-4R include TV & Radio broadcasting, broadband Internet access, multimedia services, telephony and mobile communications for government and commercial customers. Ekspress AM-4R is baselined for a 15-year mission at 80 degrees East in Geostationary Orbit. The first Ekspress satellite was launched in 1994 to replace the aging Gorizont communication satellites. The Ekspress program had the overall goal to close the technology gap between Russia and Western comm satellite manufacturers. Between 1994 and 2001, two first generation Ekspress satellites and four improved Ekspress A satellites were launched (one was destroyed in a launch failure). The Ekspress AM series of satellites was inaugurated in 2003 and represents powerful communication satellites with long on-orbit service lives and flexible communication payloads. Eight Ekspress AM satellites were orbited to date, the most recent being Ekspress AM-5 launched atop Proton last December. In addition to Ekspress AM satellites, Ekspress MD satellites are being launched to maintain an alternate supplier of communications satellites as the MD spacecraft are built by Khrunichev. Two Ekspress MD satellites were launched in 2009 and 2012, but the last launch left the satellite in a useless orbit after an upper stage failure. Two Ekspress-AT satellites using different platforms and payloads were launched in a single Proton flight in March 2014. 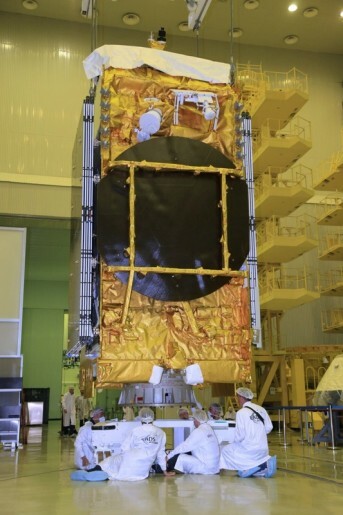 Ekspress AM-4R will be followed by the AM-6, AM-7 and AM-8 satellites that are all set for launch aboard Proton in 2014.